Is Agilent Technologies Inc. (NYSE:A) A Good Stock To Buy? Our extensive research has shown that imitating the smart money can generate significant returns for retail investors, which is why we track more than 700 prominent money managers and analyze their quarterly 13F filings. The stocks that are heavily bought by hedge funds historically outperformed the market, though there is no shortage of high profile failures like hedge funds’ recent losses in Facebook. Let’s take a closer look at what the funds we track think about Agilent Technologies, Inc. (NYSE:A) in this article. Agilent Technologies, Inc. (NYSE:A) investors should pay attention to a decrease in hedge fund sentiment lately. Agilent Technologies, Inc. was in 40 hedge funds’ portfolios at the end of September. There were 45 hedge funds in our database with Agilent Technologies positions at the end of the previous quarter. Not only that the company is slowly losing interest from smart money investors, it is not even close to being among the most popular stocks with hedge funds (see the list of 30 most popular stocks among hedge funds in Q3 of 2018). But, does that mean it is not worthy of your portfolio? We’ll try to find out. In the financial world there are plenty of indicators stock market investors employ to analyze their holdings. A couple of the best indicators are hedge fund and insider trading activity. Our experts have shown that, historically, those who follow the best picks of the best investment managers can outpace the market by a significant margin (see the details here). For a detailed analysis Agilent Technologies, Inc. (NYSE:A) we tracked this review about the stock written by a Life Science Tools analyst at Goldman Sachs. “Goldman Sachs Life Science Tools analyst Patrick Donnelly sees 29% upside to Buy-rated Agilent (on the Conviction List) over the next 12 months. Our analyst is constructive on Agilent heading into F4q18 results and sees continued positive fundamental trends across Tools, providing an attractive set-up even as Agilent shares have underperformed the group by ~230bps since DHR opened the Tools reporting season on 10/17. He believes consensus estimates coming into the quarter will prove conservative while initial FY19 guidance (and a potential increased share repurchase program) should help re-orient investors to the FY19 story, which is underappreciated in his view. With valuation still reasonable (A trades at a 2x discount to Tool on EV/EBITDA), our analyst believes Monday’s print should act as a clearing event as A has the most attractive 2019 set-up in his coverage. What does the smart money think about Agilent Technologies, Inc. (NYSE:A)? At the end of the third quarter, a total of 40 of the hedge funds tracked by Insider Monkey were long this stock, a change of -11% from the second quarter of 2018. 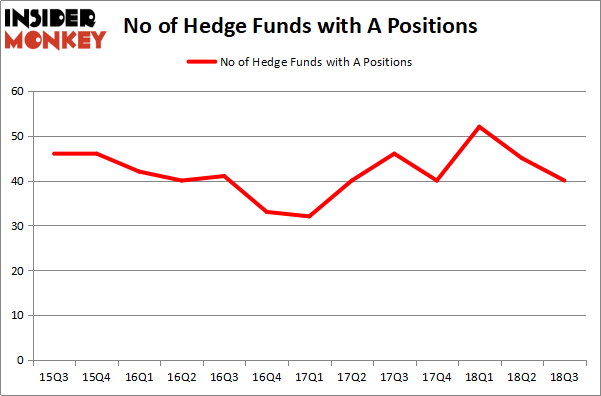 On the other hand, there were a total of 40 hedge funds with a bullish position in A at the beginning of this year. So, let’s examine which hedge funds were among the top holders of the stock and which hedge funds were making big moves. D E Shaw was the largest shareholder of Agilent Technologies, Inc. (NYSE:A), with a stake worth $355.8 million reported as of the end of September. Trailing D E Shaw was Cantillon Capital Management, which amassed a stake valued at $249.2 million. Citadel Investment Group, AQR Capital Management, and Impax Asset Management were also very fond of the stock, giving the stock large weights in their portfolios. 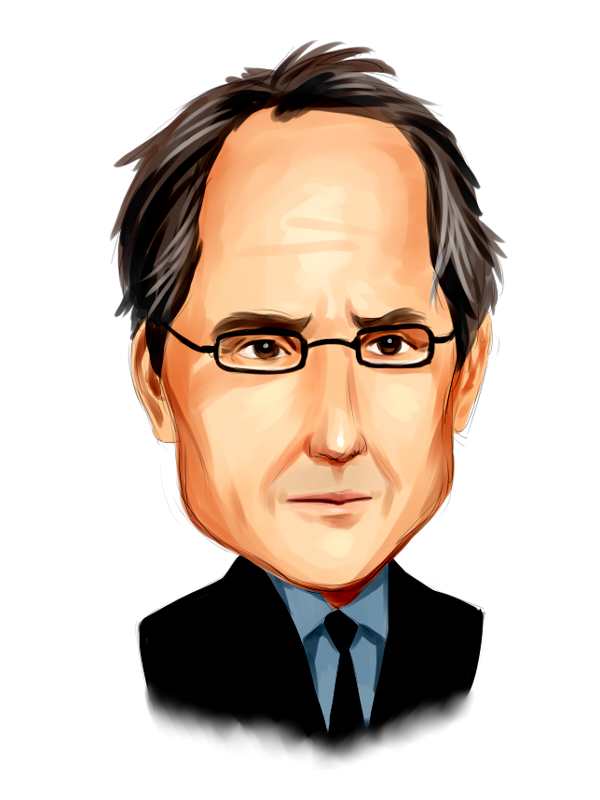 Because Agilent Technologies, Inc. (NYSE:A) has faced bearish sentiment from the aggregate hedge fund industry, it’s safe to say that there exists a select few money managers who sold off their full holdings last quarter. Intriguingly, Benjamin A. Smith’s Laurion Capital Management sold off the biggest position of all the hedgies watched by Insider Monkey, comprising an estimated $14.5 million in stock, and Jason Karp’s Tourbillon Capital Partners was right behind this move, as the fund cut about $13.9 million worth. These transactions are intriguing to say the least, as aggregate hedge fund interest fell by 5 funds last quarter. Let’s check out hedge fund activity in other stocks similar to Agilent Technologies, Inc. (NYSE:A). These stocks are Stanley Black & Decker, Inc. (NYSE:SWK), Liberty Global plc (NASDAQ:LBTYA), NetApp, Inc. (NASDAQ:NTAP), and Aptiv PLC (NYSE:APTV). This group of stocks’ market values are closest to A’s market value. As you can see these stocks had an average of 34 hedge funds with bullish positions and the average amount invested in these stocks was $1159 million. That figure was $2814 million in A’s case. Aptiv PLC (NYSE:APTV) is the most popular stock in this table. On the other hand Stanley Black & Decker, Inc. (NYSE:SWK) is the least popular one with only 27 bullish hedge fund positions. Agilent Technologies, Inc. (NYSE:A) is not the most popular stock in this group but hedge fund interest is still above average. This is a slightly positive signal but we’d rather spend our time researching stocks that hedge funds are piling on. In this regard APTV might be a better candidate to consider a long position.